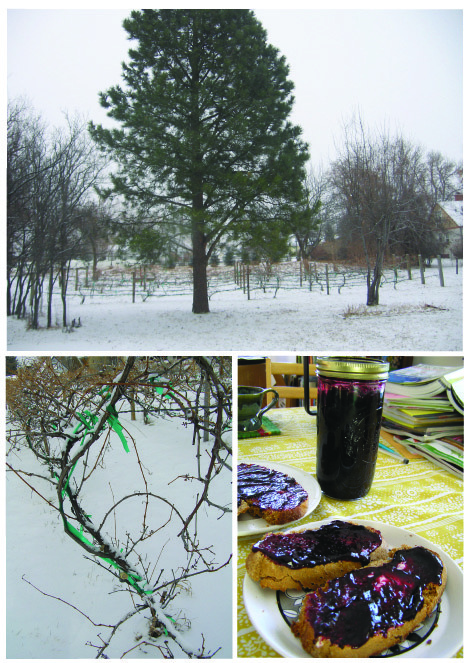 We’ve been enjoying delicious grape jelly Randi made last summer from the vines outside. Sounds like there was a very merry, very prolific harvest. The Wickstrom’s cultivated gorgeously manicured vines. These rows are stunning. So well kept, so tamed. Each sinuous vine practically sporting a starched collar and ironed slacks. Jeremy and I have never pruned grape vines before. It sounds like it might be a lot like giving a hair cut. Which is something we can do, sort of. I sure hope we don’t butcher these. We may end up with a dissident lot, in mohawks and ripped RANCID t-shirts. I’m sure we have a book on pruning grape vines somewhere around here. This entry was posted in farm update, Uncategorized and tagged grapes by Cycle Farm. Bookmark the permalink. Are you sure that purple grape color really occurs in nature? So I have a folder on my computer called “CYCLE FARM” under the “Pictures” section and I’ve been saving all of your photographs into that file (STALKER) so I can look at them 24-7, even without internet waves. I’m a little bit obsessed with the grape trio up here, just FYI.